The energy bill passed the House on Friday, but the proposed cap and trade system and new incentives for renewable energy are still a long way from going into law as the Senate needs to pass its own version. As we transition to the next round of negotiations and lobbying, stakeholders from the White House to industry trade groups, environmental organizations and cleantech companies have been weighing in on the version that won approval in the House — and on where they’d like to see it go from here. Since Friday’s vote, President Obama has continued his support for the legislation, as well as his efforts to win over lawmakers. (He phoned wavering legislators last week to help the bill clear the House.) This weekend during his radio address and media interviews, Obama called for senators to "come together" around the legislation, which he said "will finally make clean energy the profitable kind of energy." In an interview with a group of reporters, Obama also said the bill would provide "clarity and certainty" and would "end up being much less costly, much more efficient; technology is going to move much more rapidly than people anticipate." Imagine sending 10 top designers out into the world to make something. Now imagine you give them just three criteria: it has to be wonderful, desirable, and...sustainable. That's exactly what the Nature Conservancy did to create what is now an exhibit at the Cooper-Hewitt museum in New York. The designers, ranging from Yves Behar and Isaac Mizrahi to Maya Lin and Paulina Reyes from Kate Spade in New York were sent out to Nature Conservancy project sites from Maine to Alaska and from China to Bolivia. Each designer used materials found in the place and even employed local people to help fashion such useful objects as handbags, furniture, rugs, and jewelry. 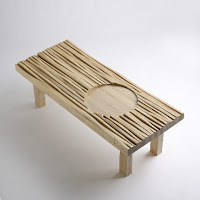 Among my favorites from the exhibit: Maya Lin's red maple Terra Bench, Abbott Miller's FSC-certified wood chair, Mizrahi's salmon leather dress and matching shoes, Reyes'/Spade's wooden tiled handbag, and Ezri Tarazi's bamboo-totem wine racks and speaker tubes. I also rather liked Hella Jongerius's failed experiment to find a design application for chicle latex from the Maya Forest of Mexico. You've got to admire her valiant efforts to transform this material, once the basis for most chewing gums, into a surface design element or even bonding material. The exhibit is on view at the Cooper-Hewitt National Design Museum in New York through January 4, 2010. For more information, visit nature.org/design or Cooper-Hewitt. You might think now is a terrible time to start a bank. The banking industry has gone from tailspin to government-owned in the past 8 months. The collapse of one major financial institution after another -- either through mergers or failures -- has made the very profession seem like, well, something to avoid like swine flu. But for the founders and principals at a new start-up bank that received its charter this past March, now is the perfect time to start a bank. If, that is, you're starting a bank based on a different value system. Enter Sandy Wiggins and Frank Baldassarre. Of the two, Frank is the only one who resembles a banker, and that's because he is, and has had an extensive career as a banking professional with such regional institutions as Fox Chase Bank of Exton, PA, and First Financial of Downingtown. Sandy was the charismatic chairman of the US Green Building Council and has three decades of experience in the building industry. Together, they are launching e3bank, set to open for business this fall and currently embarking on a $30 million private offering to shareholders willing to put up a minimum of $5,000. Their goal is to have a large number of shareholders, most of whom have made a modest investment. "We don't want to have a single large investor who could call the shots and control too much," Wiggins told me in a recent interview. "We want to be inclusive, so we've made the minimum investment low enough to democratize ownership in e3bank." So they are seeking a steady stream of small, $5,000-10,000 investors through what is, in part, a social networking campaign, trying to reach more people who understand and believe in the idea of a bank with a triple bottom line. In fact, according to Wiggins that triple bottom line (enterprise, environment, and social equity) is the single greatest distinguishing factor for e3bank. They will couple that with world-class online banking service that "will be unlike any online banking experience on offer in the US," Wiggins says. "Think about it as Web 2.0 for the banking industry." E3bank will have a limited building-based footprint. "It won't be your traditional branch bank, more like a resource center," reports Wiggins. "A place for public discourse and information about sustainability. A cross between a comfy living room or local cafe and an Apple store." They will be few in number and location because, as Wiggins says, "The greenest building you can build is the one you don't build." E3bank won't just be about atmosphere, Wiggins relates. The bank will offer a range of financial services designed to increase their customer's returns while reducing their customer's environmental footprint. They will also focus on what Wiggins calls "values-based financial incentives," such as interest rates to encourage sustainability choices and providing feedback on customer spending habits. For instance, the bank will attempt to categorize expenses automatically online and recommend energy efficiency options for customers who have consistently high gas or electric bills. Their "Green Assist" program is perhaps their most exciting innovation. Designed for residential and small business customers, e3bank will provide an energy audit, fund energy efficient and renewable energy projects, and automatically process all available subsidies, rebates, and tax incentives, as well as connect them with pre-screened contractors in their community. One goal of the bank is to be a community bank, says Wiggins, "but a community bank of like-minded individuals rather than geography." They'll be coming together around the value system the bank espouses rather than proximity to some branch office. It's an experiment worth watching. Can a bank tow the triple-bottom line? Other banks, such as Chicago's ShoreBank, San Francisco's New Resource Bank, and some community development corporations among them, have tried for a double bottom line approach. And only one, Triodus Bank in the Netherlands, has experimented with a third dimension, although ShoreBank is attempting to enter the green market as well. E3bank has the potential to revolutionize the banking industry at a time when the banking industry is in dire need of an extreme makeover. Ultimately, the goal of e3bank is to support the new green economy and a more sustainable economy and, as Wiggins puts it, his will be the bank for "everyone who cares about a sustainable world." 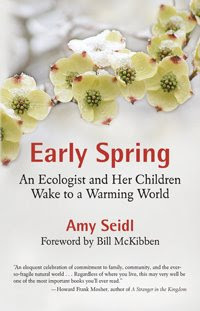 It was late spring by the time I started reading Amy Seidl's book, Early Spring: An Ecologist and Her Children Wake to a Warming World, but it was hard to tell. April showers had given way to, well, May showers; and some of the warmest days of the year had produce intense clouds of pollen that were producing equally intense allergy symptoms in every one I met. Dramatic and even extreme changes in weather patterns are one of the expected changes of a warming world. Seidl offers several others, including some terrifying possibilities involving insects, disease vectors, and pathogens. Oh my. Seidl has written a book that is equal parts nature memoir, climate witness journal (a new genre! ), and environmental impact study. Ultimately, it is a book that is both scientific and personal without being either dry or cloying. A none too difficult feat. Seidl is an accomplished ecologist and field scientist, and her book is informed and made informative by fact and research. But Seidl is also a mother and her observations are infused with a mother's concern and love for her children and their world. The two aspects are complementary and together make for an engaging mix. Seidl explains the science of climate change as well as the potential impacts. She does so by bringing the impacts home in a way that makes it accessible to her readers. "From my window I see no glaciers. I don't live near the ocean nor has my family's trip to coastal Maine been put on hold. The forecast of the scale of change that the earth will experience in the next century is unfathomable, and yet we are asked to believe it now because the risk of not believing is too grave." "to look to the landscapes where we live and ask: how they are signaling what the future holds; how do they contain indicators of the oncoming flux? By seeing these signals and rediscovering life in the landscapes where we live, we will expand our relationship to life itself and wake to what it means to live in a warming world." Amy Seidl has written a powerful and approachable book about our 21st Century dilemma and a call for "a new set of values" with which to deal with it. Climate change is already having visible impacts in the United States, according to a new and authoritative federal study assessing the current and anticipated domestic impacts of climate change, and the choices we make now will determine the severity of its impacts in the future. The report, "Global Climate Change Impacts in the United States," compiles years of scientific research and takes into account new data not available during the preparation of previous large national and global assessments. It was produced by a consortium of experts from 13 U.S. government science agencies and from several major universities and research institutes. With its production and review spanning Republican and Democratic administrations, it offers a valuable, objective scientific consensus on how climate change is affecting -- and may further affect -- the United States, according to a press release. "This report stresses that climate change has immediate and local impacts – it literally affects people in their backyards," said Jane Lubchenco, under secretary of commerce for oceans and atmosphere and administrator of the National Oceanic and Atmospheric Administration. "In keeping with our goals, the information in it is accessible and useful to everyone from city planners and national legislators to citizens who want to better understand what climate change means to them. This is an issue that clearly affects everyone." The study finds that Americans are already being affected by climate change through extreme weather, drought and wildfire trends and details how the nation’s transportation, agriculture, health, water and energy sectors will be affected in the future. The study also finds that the current trend in the emission of greenhouse gas pollution is significantly above the worst-case scenario that this and other reports have considered. Key findings can be found: here. The Renewable Energy Business Network, Mid-Atlantic Chapter (REBN) held its third event tonight, a sold-out show at the Pennsylvania Convention Center here in Philadelphia. The event was held in onjunction with the PV America Expo, hosted by Solar Energy Industries Association. Pennsylvania's newly appointed Secretary of the Department of Environmental Protection, John Hanger, addressed the crowd, which represented a good mix of entrepreneurs, investors, and service providers working in the clean tech and renewable energy space. Hanger spoke about the availability of state and federal funding for projects and companies in this sector and the importance of business leaders in the sector to speak up in the debate about the new green economy. "There are some who would dismiss this movement," Hanger said. "And they have loud voices and large audiences. You must counteract their statements with facts." Hanger also advocated for individuals to rally in support of things like House Bill 80, which would increase the proportion of electricity that electric distribution companies must purchase from renewable sources such as wind and solar to 20 percent by 2026. But a show of hands through the crowd revealed that the community has a long way to go to influencing broader policies. "You need to get to know the decision makers and let them know what's on your mind, that your businesses support Bill's like HR 80 -- the opposition is just to loud and has the ear of many in power." He also shared his optimism for the region as a clean tech hub, suggesting that expanding Pennsylvania's Renewable Energy Portfolio Standards is a step in the right direction. "Why wouldn't you want to get behind this, if it means jobs and revenue," Hanger remarked. The Renewable Energy Business Network Mid-Atlantic Chapter enables business professionals, researchers, entrepreneurs and investors to connect with one another and to promote the growth of the renewable energy industry. It hopes to catalyze efforts in the region and to spur further development in this sector. REBN believes the Mid-Atlantic region is poised to play a significant role in renewable energy, clean tech, and energy efficiency innovations in the years to come. Eating fish is good for us, but catching it in the way we do devastates the sea. Nearly nine tenths of European stocks are over-fished, and around a third are beyond safe biological limits: that is, the adult population is too depleted to provide replacement stock. Almost all cod caught in the North Sea have not had a chance to breed. Bottom dredging trawlers rip up everything in their path. The south Pacific and American coastal waters have almost been fished out. West African fishing communities are being forced from the water by the industrial fishing fleets of Europe. Russian and Asian fishing fleets greedily scoop the fish from the Pacific. On the latest estimates, around a third of the world's oceans need to be closed to fishing, perhaps forever, to regenerate stocks. According to Charles Clover, whose film "The End of the Line" is released today with the ambition of creating the momentum for reform, it is a moment that compares with the launch of the organic movement 50 years ago to fight the threat of the "silent spring". Read the full article here: Over-fishing. And if you need a reminder of the beauty of our ocean planet, here is a slide show of one of my favorite places on earth, Raja Ampat, Indonesia. I was diving there four years ago. How I long to get back there: Raja Ampat. And here is a link to the official World Oceans Day 2009 web site: A Sea Change. Imagine a world without fish? I'd rather not, thank you. "GoodCompany Ventures is such a good idea," Philadelphia Mayor Michael Nutter told the crowd gathered on the porch of Building 101 at the Navy Yard. "I wish I'd thought of it." GoodCompany Ventures, an incubator for businesses with social impact, launched today with a virtual ribbon cutting by Mayor Nutter. "We'll all close our eyes and imagine the ribbon being cut, because that's how business gets done these days," the Mayor quipped. All kidding aside, Mayor Nutter seemed genuinely pleased today to be welcoming GoodCompany Ventures -- and the ten start-up social enterprises that will be working at the Navy Yard over the summer -- and recognized how this effort supports his overall goals to make Philadelphia the nation's greenest city. He pointed to development at the Navy Yard, which he called "Center City South," an area the size of Center City, which has been redeveloped over the past ten years or so since the U.S. Navy closed its base there. "I hope these companies will enjoy their time here at the Navy Yard this summer," said Pennsylvania Industrial Development Corporation (PIDC) head Peter S. Longstreth, "And that they will want to move in as tenants as they expand their businesses developed here." The Navy Yard is home to more than 80 companies employing 7,500 people, including Urban Outfitters and Tastykake, in 5.5 million square feet of renovated space. PIDC, is the developer of the Navy Yard and a partner in GoodCompany Ventures. "GoodCompany Ventures is designed to demonstrate that you can make money and do good," said Jacob Gray of Murex Investments and a partner and co-founder of GoodCompany. "And I think the companies we have lined up for this first cohort exemplify that goal." The GoodCompany Ventures incubator will provide guidance and support to a group of hand-picked social entrepreneurs each summer. Through group sessions, one-on-one mentoring, and providing access to pro bono services, GoodCompany will help businesses at varying stages of their development. BlackGold Biofuels and the GoodCompany Ventures launch were featured in an article in the Philadelphia Inquirer on Sunday: read it here. Other companies in the inaugural cohort of the incubator include BLOX, a partnership between Philadelphia developer Onion Flats LLC and modular building manufacturer Landmark Building Systems Inc; Cyrus-XP LLC, which is developing a computer information platform for the growing long-term care market; and Math Foundations, which was launched by Angela McIver, a former math teacher, to provide math-remediation consulting to schools and job-training programs.